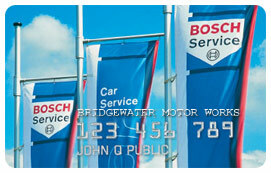 Bridgewater Motor Works, LTD. is now offering customers an easy way to pay for your auto repairs -- with the Bosch Car Service Credit Card! Large auto repairs are usually unexpected and can send the budget into a tailspin. That's why Bridgewater Motor Works is happy to offer a new way to help: the Bosch Car Service Credit Card from Credit First. This credit card is for auto repairs only and offers stress-free financing. It's also a great idea for a son or daughter when they're off to college. In these troubled economic times, you need every edge you can get. It's worth checking into. date if the purchase balance is not paid in full within 6 months or if you make a late payment. Applicable to purchases made January 1 through June 30, 2013. APR: 22.8%. Minimum finance charge: $1.00. CFNA reserves the right to change APR, fees, and other terms unilaterally.